I really should just sent you to Exploratorium which has an excellent section on sugar chemistry, but sugar chemistry is so cool, that I have share it with you myself. In fact sugar chemistry is so interesting that it supports a whole sector of the food industry. I am, of course, talking about candy. Food Scientists typically divide the candy industry into chocolate and non-chocolate candy and most of the non-chocolate candy is made from different forms of sucrose. If you remember sugar is the common name for sucrose, which has the very confusing chemical name of β-D-fructofuranosyl-α-D-glucopyranoside which is a fancy way of saying that it is made up of glucose and fructose. In this post, I will interchange the words sugar and sucrose, but in chemistry sugar refers to saccharides which are considered to be small carbohydrates. Candy technologists not only control the sugar concentration by heating the sugar-water mixture to a predetermined temperature, they also control the final physical arrangement of the sugar molecules by the other ingredients added and by the way they treat the sugar-water mixture while it is cooling. This determines whether the solution sets in a crystalline form or not. The non-crystalline form is also known as amorphous. Thus sugar candies are divided into crystalline and amorphous. Crystalline candies include fudges, fondant and rock candies. Amorphous candies include cotton candy, hard candy and brittles, where the sucrose has been set into a glass, and caramel and taffy, which are chewy rather than hard. Food tastes best when browned. Food in always complex unless you are studying something quite simple such as a beverage with few ingredients (vitamin water, anyone?). Even sucrose has a complex chemistry, more of which I will share in a future post. So individual NEB reactions cannot be isolated in food. Quite often intermediates and products from one reaction become intermediates in another reaction, especially in the Maillard reaction. Thus, most food chemistry textbooks use Non-Enzymatic Browning (NEB) as synonymous with the Maillard reaction. However, the other NEB reaction cause browning in food without the use of enzymes. Both caramelization and lipid oxidation cause browning in certain foods, i.e. sugar-based and fried foods, respectively. Ascorbic acid degradation is significant in food with a low pH (high acidity) especially in citrus juices. The reaction of flavanoids is important in highly colored foods as the colorful anthocyanins degrade and lose their color. The reaction of flavanoids may also be important in soy protein, but less because of a color change and more due to a lose of isoflavones. My major interest in food chemistry is how food changes during processing and storage. I am especially interested in how color changes take place. The reactions I am interested in are called Non Enzymatic Browning reactions to differentiate them from the browning that occurs when you cut an apple or banana, which involves an enzyme. Non enzymatic browning (NEB, non enzymic browning) reactions are the most important reactions in food, and, no, I am not biased. Just image the aroma of melting chocolate, freshly baked bread or a roasting leg of lamb, the golden color of a croissant, the dark amber color of a well brewed beer; caramels, toast. These are all caused NEB reactions. Numbers (3) and (4) are not typically on a list of NEB reactions, but I did my thesis on ascorbic acid browning and it definitely goes brown without oxygen and without enzymes. The degradation of flavonoids is one I have added and came to me in flash of inspiration when at a conference. I am sharing it with you now, so this is new even though I had the idea three or four years ago. Simple sugars are carbohydrates. Glucose and fructose are monosaccharides and sucrose is a disaccharide of the two combined with a bond. 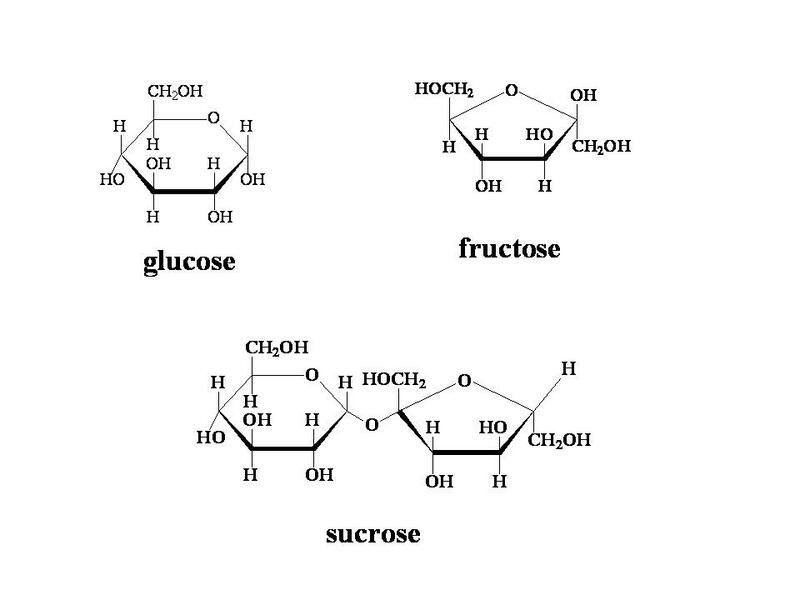 Glucose and fructose have the same molecular formula (C6H12O6) but glucose has a six member ring and fructose has a five member ring structure. Fructose is known as the fruit sugar as its make source in the diet is fruits and vegetables. Honey is also a good source. Glucose is known as grape sugar, blood sugar or corn sugar as these are its riches sources. Listed in food ingredients as dextrose. Sucrose is the sugar we know as sugar or table sugar. Typically extracted as cane or beet sugar. If sucrose is treated with acid or heat, it hydrolyzes to form glucose and fructose. This mixture of sucrose, glucose and fructose is also called invert sugar. Fructose is more soluble than other sugars and hard to crystallize because it is more hygroscopic and holds onto water stronger than the others. 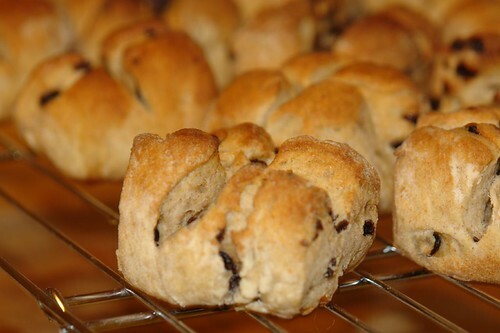 This means that fructose can be used to extend the shelf life of baked products more than other sugars. Wikipedia has lots information on sugars, including information on the three I am interested in fructose, glucose and sucrose. He admits that he himself had problems during his thesis of separating out science from technology but he states very strongly that molecular gastronomy is science and molecular cooking is using the results from molecular gastronomy to create new food items or improve old ones. This’ Ph.D. thesis, on Physical Chemistry of Materials, was entitled Molecular and Physical Gastronomy or the equivalent in French. The confusion between the science, art and technology of food is present in food science. That there does not appear to be a final definition of molecular gastronomy adds to this confusion, especially as chefs have taken over this term, rather than using This’ preferred Molecular Cooking. Khymos gives a good summary of the different definitions. I do have problems with the fact that Molecular Gastronomy is so trendy and considered to be the saving of the world’s food supply. [So I exaggerate? What’s the problem?] Many articles about Molecular Gastronomy and the restaurants that practice molecular cookery appear to have never heard of food science. So I appreciated the fact that This states that molecular gastronomy is part of food science but I struggle to place it within the traditional subject areas of food science. It overlaps mostly with food chemistry. At least This’ part of Molecular Gastronomy is heavily physical chemistry based. The research undertaken is more directly relevant to cooking and culinary arts than much of food chemistry. For example, my research on the Maillard reaction has few direct practical applications, unless you are willing to mix amino acids and sugars together in your kitchen. I still would not recommend eating the results of my research. Within the article he gives an excellent summary of what science is – the idea of testing a hypothesis to give new information which increases our knowledge of a system. I might even use some of these ideas for teaching. The biggest problem with food is that it is unstable. Even relatively stable food products change over time. There are two ways in which these changes occur. Spoilage caused by microorganisms. Moldy bread is a good example. Preserving food has been going on for centuries. Without it humans would have been unlikely to stop being nomadic. By preserving food it allowed them to have a food supply throughout the seasons and not move to where there was fresh food growing. Later on, preserving food allowed for travel long distances where there was no certainty that fresh food existed, including off the planet. Preserving food is essential a way to extend the shelf life of that food. Shelf-life to food scientists has a particular meaning representing when the food quality has deteriorated either from a sensory perspective or from a chemical perspective. Obviously, sometimes these are the same thing. There are two ways in which to consider food preservation, how does food go bad and how can we stop it. How food deteriorates depends a lot on the particular food item. For example high moisture foods are more likely to have bacterial damage than low moisture foods. Living foods under changes after harvest; this includes the fact that fruit and vegetables continue to respire even after being picked and the fact that muscle protein changes after the slaughter process. I could write about all of these changes but that would be several posts long, if not unending. More interesting is what do we do to preserve food and what changes does that cause to the food item. The commonest way to preserve food is to reduce the available moisture content, which is also known as the water activity. Drying can be done by drying, salting, and making jams or jellies. In the latter process, the food is preserved with large amounts of sugar. This reduces the water availability because sugar is hygroscopic and holds on to that water for itself. The fruit, and it typically is fruit that is preserved in this way, is also cooked which destroys enzyme activity, unfortunately degrade thermal unstable vitamins and softens the cell walls. For fruits high in pectin, softening the cell walls releases the gum which, when the jam is cool, sets. This gives jams and jellies their firm structure. Pectin can be added to fruit low in pectin so that the preserve sets. Even though this is a way of preserving, fruit that would normally last a week or two can now be kept up for a year, changes to the fruit preserves will take place during storage. Light colored jams will darken. Unsurprisingly, reduced sugar preserves are not a long lasting as regular preserves. Dried fruits are common and drying is also used a lot for meat preservation. Drying or dehydration is the removal of moisture, the dryer the better as far as shelf life is concerned. There are many ways to dry foods, from sun drying to freeze-drying and spray drying. The latter two being more likely commercial methods, whereas heat drying and sun drying could be carried out at home. The method of drying alters the food in different ways. For example, freeze drying results in the formation of food products that are very little changed from the original – just without any moisture. As the new Strawberry pieces in cereals show – adding moisture back results in almost original fruit piece. Well, sort of. Spray drying, which is commonly used for liquids such as milk or juices, results in a fine powder. Salting, smoking, and curing are mostly used for meat and fish. The addition of salt or smoke causes dehydration of cells through osmosis – the water moves out of cells into the salty surroundings. This causes the cells to die or become temporarily inactivated. This includes bacterial cells as well as food cells. Thus, bacteria cannot grow. However, the food itself is very different from fresh. We have got used to this as bacon, lox, kippers and ham are all treated in this way. As you can see removal of available water does not have to occur by dehydration, other techniques such as adding salt or sugar have the same effect. In the last issue of New Scientist (issue 2671; 30 Aug 08) there is an article (p22) in the technology section about molecules we can add to food that will enhance the flavor. These molecules are flavorless themselves but increase the sweetness or saltiness of the food. There are also molecules that will block the bitter taste of foods such as grapefruit. These molecules are being developed by testing them against cell lines of taste receptors. These receptors have been altered to glow flourescent green when responding to the taste in question. These cell lines have also been useful in furthering sensory research – finding new taste receptors for compounds such as calcium chloride. The cell lines are obviously not as good as the human tongue and can only respond to the taste that they are programmed for, typically sweet, salt, sour, bitter or umami. Hence, when a flavor enhancer has been developed, shown to be safe for consumption, it has to go through a human sensory trial. 1) We get habituated to levels of flavor. So adding a sweet flavor enhancer may make us used to a high level of sweet tastes. This is already true in the US, where food is much sweeter than that found in Europe. 2) This is pandering to the American preference of bland tasting food. In the article they were looking for bitter blockers for the after taste of soy but Asians and I (and probably many other vegetarians) do not find soy bitter. Do people really dislike the idea of strong tastes so much, what about sweet and sour sauces? 3) I would prefer to see companies using more natural ingredients, especially herbs. Surely these new compounds are no cheaper than herbs? I cook without adding any salt but I use a lot of herbs. My Dad, who typically adds salt to everything does not do this to food I have cooked. The herbs make up for the absence of salt. Admittedly if I did use salt I could reduce the amount of herbs added to get the same flavor effect as salt enhances flavors.